Ghazala Ahmad-Mear is a surgeon in the NHS working in Sheffield. She is also an Associate Postgraduate Dean for Health Education England - Yorkshire and the Humber, and is a wife and a mother of two. In her spare time she likes adventure! On the 15th January 2018, the South Pole Energy Challenge became the first polar expedition in history to use only renewable energy. This was clean energy technologies in the coldest, driest and most inhospitable place on earth. By personal invitation, she was the only female member of the team. Ghazala is very passionate about inspiring people to engage in renewable energy technology for a more sustainable future. How long did the trek take? 8 days in total from 89s to 90s but I did 5 days over 30 miles. The incessant biting, stinging and damaging wind is like no other, it searches out the smallest of gaps in your cover, intent on stealing the warmth from within you. Despite trying various boots, liners, hot pads and socks, from the start at 89°S, my toes had remained worryingly cold. After 5 days and over 30 miles of hauling, they remained numb. Then, on our 5th day I fell ill and experienced some hypothermia. I was very concerned as was our guide, Devon. We made camp early and took measure of the situation. There was a Twin Otter flight to the South Pole scheduled for the next day. I decided to take this opportunity and fly ahead of the others to the Pole. There would not be another such flight and I did not want to risk the success of the expedition. I would wait a couple of days at the Pole for the team to join me. My falling ill led to two remarkable events. My delaying the expedition meant that Robert Swan was reunited with his son Barney and the other members of the South Pole Energy Challenge Team, Kyle O’Donoghue and Martin Barnett, as they caught up with the Last Degree team. 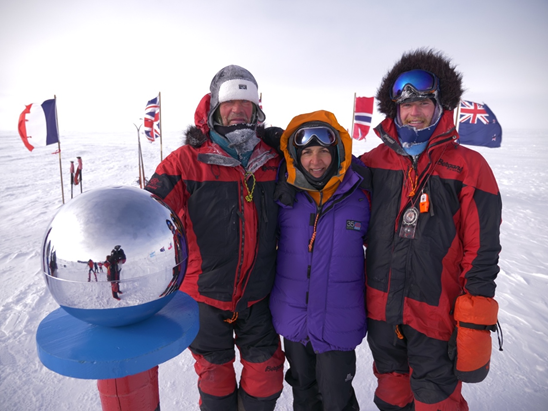 But also we found that I would arrive at the South Pole on the actual 32nd anniversary (11.53pm 11th January) of 'In the Footsteps of Scott' expedition which I was celebrating with my trip! Something positive always comes out of misfortune, it's all about perception. How did you spend your time when not trekking? Making and breaking camp, keeping warm melting ice to make water, cooking, eating and sleeping - making sure things are hung up in your tent to dry - tending to feet, hands and face to ensure no damage, mending if you had to. not leaving a carbon footprint, the biofuels, NASA sledges... how easy did these make the trek? Were there any challenges? The biofuels were used to top up melted ice water to hotter worked well. The NASA solar panels helped but it was extra weight but effective. We also had solar panels to charge our batteries for phones, cameras and satellite packs. The wind powered generator was too cumbersome and inefficient compared to solar and was declined. 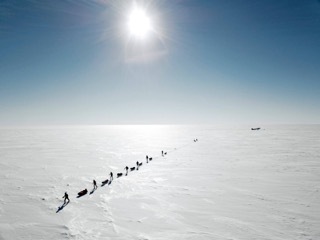 What was it like to be finally at the South Pole? It's an amazing place and felt like a homecoming. Emotionally it was overwhelming with the history of the place in respect to my husband and his FOS expedition. I’d wanted to be here for half my life. Antarctica is an incredibly beautiful yet unforgiving place. The sun circled and the white/blue horizon was fixed around us. The monotony of sled hauling and bizarrely, the unchanging scenery, remaining constant day after day, fools one into thinking that no progress is being made, other than the change of co-ordinates on our GPS. Yet this monotony opens corners of space within oneself to much discovery, allowing me to place in perspective what my husband’s team, 'In the Footsteps of Scott", experienced for 70 days and 900 miles, with no communications whatsoever, 32 years ago. I wished to be part of the story. My time there was a hugely humbling privilege. I am still processing it all. Do you feel the trip changed you as a person? It has changed me. Friends have mentioned I’m more relaxed and calm. Admittedly for a few weeks before I left it was all a bit crazy and with Christmas but i do feel it. Antarctica is so vast. I felt so small and that one isn’t really very much in the world unless you do something significant but that it doesn’t need to be a big thing you do to be significant. In my work - to say to someone , it’s alright you are going to be okay’ or ‘I will look after you’ can be very significant to the recipient. Perception plays a huge part in my life. I always manage to find some positive in the most unlikely of bad situations. The inward journey whilst one gets into the rhythmical pace of sled hauling was very therapeutic, I have worked on this during my long distance swimming that I did as part of my training. I get deep inside myself, search out and identify those areas of my person that disable me and then work on letting them go. It’s very freeing. The space the they leave behind is a great source of strength for me. Its beyond the physical and emotional being, a space I call beyond the fear and I come back finding its easier to reside there now. I find that hugely empowering. I feel that having spent the best part of 2 years working on getting my part in this expedition together, by investing in effort and time ‘step by step’ I am able to fulfil a dream. It has pushed back boundaries. I come back finding I am needing very little in life. I feel more confident and strong to face the challenges ahead. 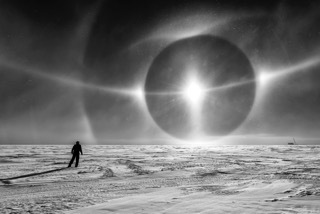 The three very special things on my personal agenda were to experience the Antarctic Plateau, see a parhelion and be present at the South Pole on the anniversary of the FOS exped. I achieved all three. In the amazing context of SPEC. The way it happened was not planned. Rob came out 300 miles - too slow. But he joined the Last Degree - very different experience with him with us. We didn’t join SPEC when dropped 89S, as they were 17 miles behind us and so we projected meeting up with them almost at the pole. My being ill and stopping for a day allowed them to catch up and we were all together , one big happy family! 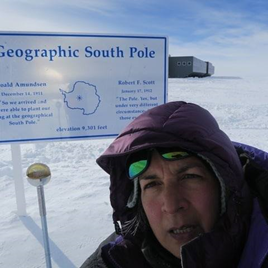 I ended up being at the South Pole on the FOS anniversary 11/01 alone but there. In hindsight it could not have been planned better with all the variable and changes! After such an amazing adventure, how are you settling back into daily life? I returned back to work 3 days after arrival in the UK. The first couple of weeks were very much an 'out of body experience’ - I was doing it but at a distance above and looking upon myself - very weird! I have steadily landed. Unlike returning from previous expeditions, when I’ve often had a bit of a low, I have not experienced that this time. I have protected myself and my time so not completely immersed myself in work without continuing my reflection of the Antarctic. What's next for you, how are you continuing the step-by-step campaign? I'm working hard to ensure that my trip is well used to engage anybody and everybody. Using renewable and clean energy technologies in Antarctica allowed me to focus on the energy dependency of our daily lives. It does take effort but we can all do something to engage in the renewable revolution. It’s about the bigger perspective rather than short term reward. We all have a choice and engaging / inspiring a sustainable choice is what SPEC is all about. I’m continuing the work I’ve been doing for schools and clubs. Within my work in the NHS, I am now continuing to spread the word of the success of the SPEC expedition and all it stands for. You are a huge inspiration to women all over the world as a female environmental activist. This International Women's Day, is there any advice you can give to women who want to trek to the South Pole, change the world, or to just chase their dreams and aspirations at home? 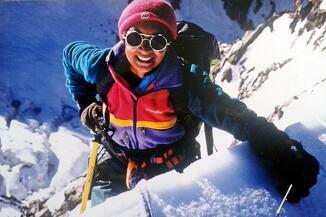 Being the only woman on the whole expedition was an amusing and welcome challenge. I am used to leading an all male team and so understand gender-related mental, emotional and physical soft skill dynamics! I love the Antarctic but I have no personal need now to go back to the South Pole. But I am hoping my experience there can be used to inspire ALL to follow your heart, which can be the boldest act. It s a model of the most unlikely event becoming real through focus, energy and determination, and how being bold can be the hardest thing to do but always brings genius, power and magic. When planning strategy, have clear and simple story and think big. Don’t underestimate your own voice. BE yourself and speak from the heart. Love yourself, be in love with your life and dream. Be prepared to be consumed by it, otherwise it won’t happen. Then be prepared to go crazy trying to achieve it! Coldest Selfie ever! At the actual axis of the South Pole, the marker here is repositioned every New Year by 10m, due to the movement of the 3 miles deep glacial ice, on which I’m standing.